While Infusionsoft gives great reporting on broadcast emails, and individual emails sent out, it can be difficult to get open rates from the Campaign Builder. In fact, traditionally the only way to track email opens in an auto-responder sequence is to pull a pivot table from the email reports. At least until now — with a great trick from Mike Doughty — that allows you to tag each contact who opens your email so that you can analyze the effeciveness of your auto-reponder sequences, and even run a secondary sequence for those that opened your email (or those who didn’t). Finally the power of broadcast segmentation for all your automated funnels. Mike has put up a quick walk-through video of how to set up the links — or you can follow along with the instructions below. The Automation link is the magic sauce that lets you attach a tag to anyone who visits that link. In order to track email opens, Infusionsoft uses an invisible pixel that tracks whether the email was viewed or not. We’re going to use the same idea with our custom Automation Link. Open your Automation Link by clicking on the [Edit] link on the Automation Link page. (Marketing > Settings > Automation Links > Automation Link). If you still have your Automation Link edit page open from when you were creating it, congrats, you’re a step ahead! In the URL, you’ll see a part that says ID= SOME NUMBER. Copy JUST that number. Replace YOUR-LINK-NUMBER with the number you just copied. Now we’re ready to set up your email! Aaaand you’re done. 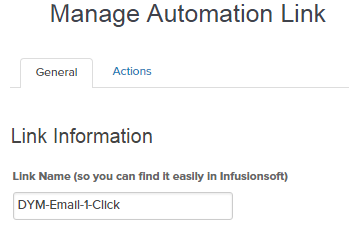 Whenever someone opens your email they’ll be automatically tagged in Infusionsoft. You can then set up a separate sequence to deal with people who open (or don’t open) your emails, and track your open and conversion rates by tag in an analytic tool like SegMetrics. Got any other awesome tips? Please leave them in the comments!